"In this stimulating business manual, Gannett, founder and CEO of the marketing analytics firm TrackMaven, asserts, 'There is in fact a science behind what becomes a hit,' namely, neuroscience. He discusses recent psychological research into the appeal that both the novel and the familiar hold for people, writing that successful innovators “find the sweet spot” between 'safety and surprise, similarity and difference.' Gannett debunks the myth that creativity is imparted to select individuals by sharing the little-known but entertaining backstories to enduring creative breakthroughs by the Beatles, J.K. Rowling, and others. He also examines whether hard work and practice can compensate for a lack of innate talent. The central focus of Gannett’s treatise for entrepreneurs with an idea centers on his 'four laws of the creative curve,' which include consumption (familiarizing oneself with a chosen field), imitation (learning from successful predecessors), creative communities (finding collaborators and/or a support group), and iterations ('the use of data-driven processes to refine ideas'). Gannett offers the ideal balance of valuable instruction, accessible writing, and refreshing stories, providing tangible evidence that the creative process he advocates actually works for businesspeople." "A juicy, rollicking tour along the path toward creativity. The good news is that there is no writer's block, and if you want it badly enough, creativity awaits." "Insightful, inventive and practical. . . The Creative Curve shifts our understanding of creativity from a difficult-to-repeat light-bulb moment into a well illuminated and researched path to continual inspiration and creative success." "All human beings have the potential for great creativity. Gannett explodes the myth that creativity is some mystical talent some are born with while others are not. Read this book to help understand how to unlock your own creativity, and the creativity of every person on your team." "The perfect book for any marketer who feels that they want to be more creative but doesn't know how. Gannett makes clear that creating hit products and campaigns, is not something mystical, but rather a critical skill to learn and arm yourself with." 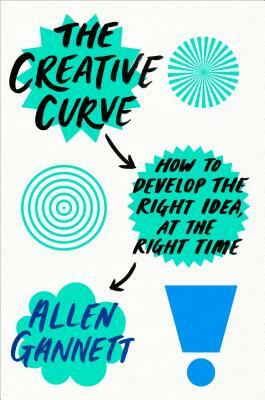 "The Creative Curve is a must-read for anyone in the business of innovation. And Allen Gannett is one of the smartest entrepreneurs and writers of his generation. His writing is fresh, compelling, and delightfully fun to get through. You'll find yourself wishing for even more." “Can we learn to be creative? The Creative Curve demonstrates, persuasively, that yes, you can. Gannett interviewed living idols and leading researchers. From this, he paints a picture of creativity not as some mystical event, but as a practical skill rooted in neuroscience. Ultimately, he delivers on the cover's promise, demystifying how to develop the right idea, at the right time. An essential read."